You know what I love about zombies? So damned delicious. Obviously Courtney of Courtney’s Cakes agrees with me. And everybody knows that agreeing with me is the first step to preventing filthy, filthy Communism. Naturally, Courtney crafted this zombie cake to celebrate Day of the Dead or something, right? The cake was for a Halloween party that my sons’ karate instructor puts on every year. Ah, yes. Little kid’s birthday party. My second guess. UPDATE: Courtney followed-up to clarify that the cake was for the karate instructor, not for her son. So please disregard the previous tongue-in-cheek joke or whatever. 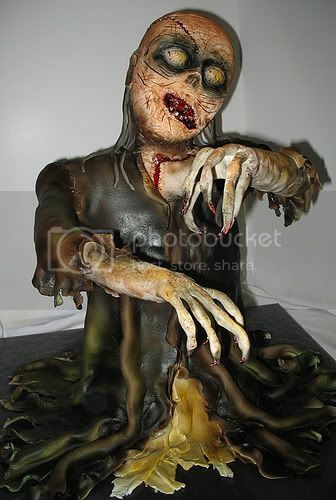 My main goal was to top the zombie I made last year:) The cake is supported by a PVC frame attached to a plywood base. The body is about 7 layers of vanilla cake. I used rice krispie treats for his head. All of the clothing is fondant, but I used modelling chocolate to cover the head and for the hands. It doesn’t dry like fondant so there’s more time to work with it. To color the cake I used a combination of airbrushing and painting. That’s right, purists, it’s got a PVC frame. Guess what? Not even half of the remaining questions on LOST will ever be answered. So life is just full of disappointments for you, isn’t it? Check out more of Courtney’s cakes. Just remember GWS, this all started when you called a bunch of cardboard with candy glued on a “cake”. If you can slice through it and serve it on a plate and then enjoy delicious cakey goodness that’s legit. I like that criteria, Nathan.